When looking for a cleaning company for your office, it is vital that you find the company that perfectly fits your needs. Often, this means hiring a local cleaning company, such as South Jan. These companies are often able to provide better service as they are more dedicated to their customer base, are able to offer better quality work, offer the opportunity to support the local community, and are often more responsive to your needs. Local cleaning companies often have a vested interest in the community that they are located in. They rely on developing and maintaining strong, meaningful relationships with clients in order for their company to grow and sustain. Without these relationships, they will often lose business to major corporations and chains. As a result, you can rest assured that a local cleaning company will always provide you with their absolute best service. Since they are not spread thin by having to service clients around the state and country, they are able to focus all of their resources on you. Small businesses are monumentally important to the well-being of local economies as well as the national economy. By choosing a local cleaning company to service your workplace, you can give back to the local community in which your business is located. Small businesses stimulate local economies by providing innovation, needed services, and employment opportunities to their communities. Larger corporations even depend on small businesses to complete services through outsourcing. Additionally, small businesses are able to adapt to the quickly changing demands of their communities due to their smaller client base. Due to this, many customers will remain loyal to small businesses through an economic crisis. This loyalty helps strengthen the local economy further as it means that local companies are able to stay afloat during rough economic periods. 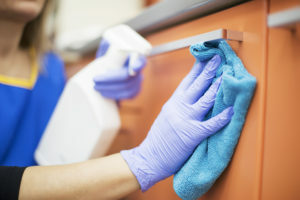 With a local cleaning company, it is highly likely that you are going to always know who to talk to about what problem. Smaller companies are often much more open for communication, and are more willing to solve problems as they arise. The fact of the matter is that you are more important to a small business than you are to a big corporation. Customers tend to receive much more specialized and timely support from local companies than national businesses. Local cleaning companies are often much more focused on their work than a chain might be. The reason for this is that smaller companies are run by people, not stockholders or board members. With local companies, the owners are often much more invested in the quality of their work. Their primary concern is not expanding to other areas, or increasing profit margins. Their primary area of concern is the quality of their work, and providing the best service that they can. Local cleaning companies are often a better choice as they tend to provide better customer service, attention to detail, and economic growth. If you have any questions regarding the benefits of local cleaning companies, or you are interested in Columbia, SC and are interested in hiring a locally owned cleaning company, feel free to contact us.